Update: The Falcon 9 launch was aborted right as it was about to launch due to a higher than normal combustion pressure in engine 5. The next launch window will be on May 22 at 3:44 EDT or 12:44 PDT. Stay tuned to GeekTech for updates. 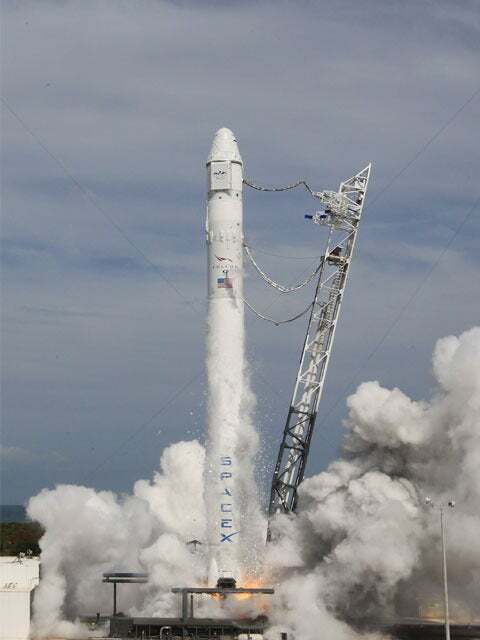 Late last month, SpaceX test-fired its Falcon 9 engines and planned a launch to the International Space Station (ISS) on May 7. SpaceX pushed this launch back but it's now slated to take place on May 19 at 4:55am EDT (1:55am PDT). This upcoming launch will be a part of the Commercial Orbital transportation Services (COTS) program, an effort to help NASA find a private launch provider to ferry crew members and cargo to the ISS. According to Wired, the delay was due to possible congestion at the ISS with this week's launch of the Soyuz. However, the two-second Falcon 9's Merlin rocket engine test was successful. The upcoming launch at Cape Canaveral will send the Dragon spacecraft into low-Earth orbit where it will then dock with the ISS if everything goes as plan and NASA gives the green light. To get said green light, as the capsule orbits the Earth and heads toward the ISS, SpaceX will use the capsule's sensors to run multiple tests and system checks to make sure that the Dragon capsule is working properly. On the fourth day of the mission, the Dragon capsule will attempt to berth with the station by getting extremely close to the ISS, where it will then be grabbed by the ISS's robotic arm and then attached to the station. At the ISS, astronauts will unload the cargo from the capsule, as well as fill the Dragon with return cargo. After about two weeks, the Dragon will detach from the station and return to Earth and splash down somewhere in the Pacific Ocean, west of Southern California. This is one launch that you won't want to miss! If successful, it will be the first time that a private company has ever berthed their own capsule with the ISS. You can check out spacex.com, where the company will webcast the launch, complete with commentary from SpaceX corporate HQ. The webcast will start about 40 minutes before launch and will go until the Dragon separates from the second stage of the Falcon 9 rocket. NASA TV will cover the event starting at 12:30am Saturday morning. Spacevidcast and SpaceFlight Now may also cover the launch as well (they have covered a number of launches live in the past, but we make no guarantees.). For all the specifics on the upcoming launch make sure to check out the official SpaceX COTS 2 Mission Press Kit (pdf).